When Can Encore Azaleas Be Moved? Are Azaleas Green All Year-Round? How to Plant Azalea in B.C. How Fast Do Azaleas Grow? Encore azaleas are crossbreeds of spring-blooming azaleas and summer-blooming rhododendrons. By crossbreeding these two shrubs, Encore azaleas bloom in the spring, summer and fall. Fertilize your Encore azaleas so that they thrive and grow large, plentiful flowers. Wait until after the last frost (usually in March or April) to fertilize Encore azaleas. If you plant your azaleas in the spring or summer, apply fertilizer after planting. However, if you planted your bushes in the fall or winter, don’t fertilize them until after the spring. Fertilize using azalea fertilizer or azalea feed, as marked on the packaging. 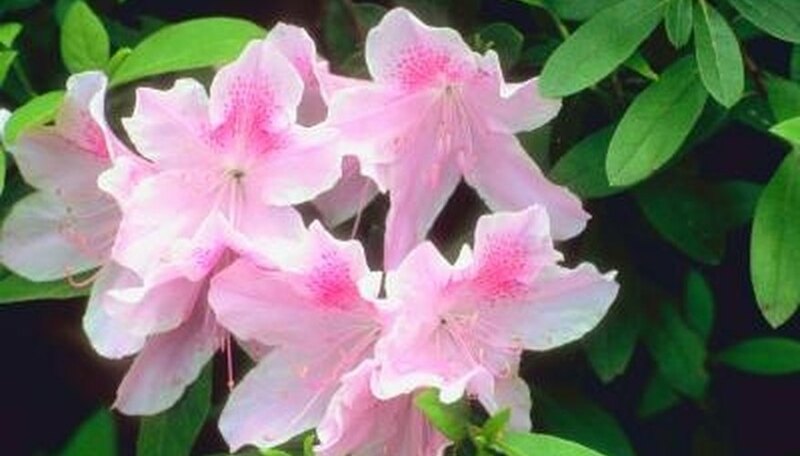 There are many brands of azalea feed and fertilizer, so read dosing instructions carefully. Generally, about a tablespoon of fertilizer is needed per plant. Some granular fertilizers are sprinkled over the root area of the plants, while others must first be dissolved in water before applying. Repeat fertilizing at specific intervals. Again, each brand of feed is different, but generally, you should reapply every one to two weeks. Stop fertilizing your Encore azaleas after August. Fertilizer encourages new buds and you don’t want new buds forming for the approaching dormant season. Sometimes after planting new Encore azaleas in the ground, the plant suffers a shock and won't flower until the next growing season. As long as the plant is growing and looks healthy, it will adapt to its environment the first growing season and bloom the following year. These azaleas are known for skipping a flowering cycle when transplanted. Encore azaleas bloom for three seasons because of how the azalea has been bred. Because the plant can bloom for so many seasons, it needs to have at least four to six hours of direct sunlight to bloom. Plants do the best in areas where there is some afternoon shade. If azaleas are planted in areas without any shade during the day, extra care is needed to keep the soil moist. Long dry spells can reduce blooming if the soil dries out. Azaleas need moist soil to keep the plant healthy and blooming. Manually irrigate the soil during dry periods, giving the plants at least 1 inch of water once a week. 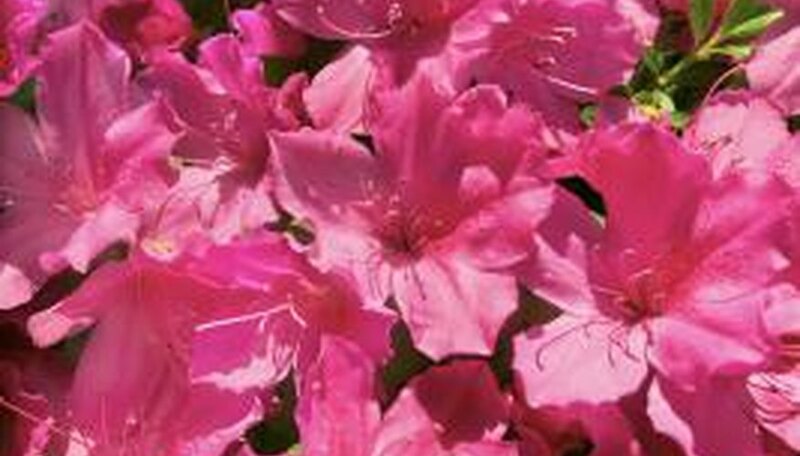 Encore azaleas that are not blooming or have few blooms will benefit from an application of fertilizer. Encore azaleas don't need fertilizer in the first year, but benefit with one application every two weeks after the first growing season. The best fertilizer is one that has a 1-3-1 nitrogen-phosphate-potassium ratio. Phosphates, the middle number, promote flowering, and nitrogen, the first number, promotes foliage growth, which you don't want if the plant is growing healthy green foliage. Keep Encore azaleas consistently moist throughout their first year. After the first year, Encore azaleas don't need to be watered regularly unless the weather is dry for extended times. If the weather has been dry, water them well in late autumn, before the first freeze. 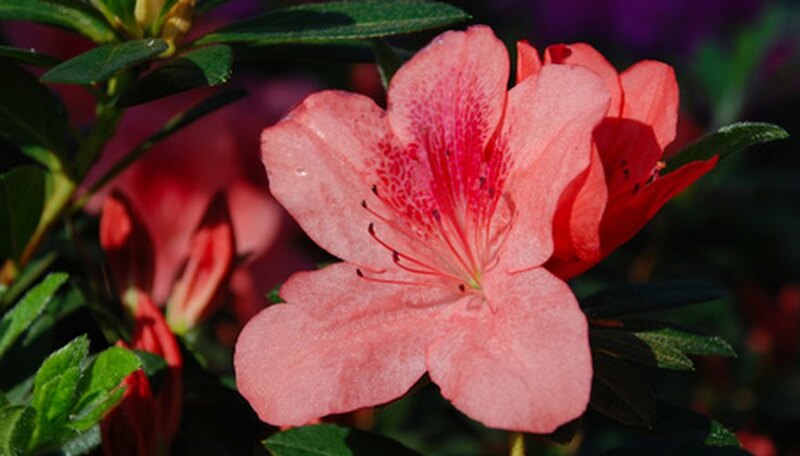 Fertilize Encore azaleas immediately after the first bloom with a fertilizer formulated specifically for azaleas. This is all the fertilizer that Encore azaleas require. Never fertilize in autumn, because new growth will make the plant more susceptible to damage during cold weather. Prune Encore azaleas as needed to maintain a pleasant shape. Otherwise, they require no pruning, and it isn't necessary to remove spent blooms. Any pruning should be done immediately after the first blooming, because later pruning will risk interfering with the second blooming. Cover Encore azaleas with an insulated garden cover their first winter. After that time, a 3 to 4-inch layer of organic mulch such as pine needles or bark chips will be enough protection to insulate the roots. Spread the mulch around the plant, but don't pile it up against the trunk. For abundant flowering, azaleas need four to six hours of sun per day. If planted in a shady site, Encore azaleas will not provide repeat blooms during the year. 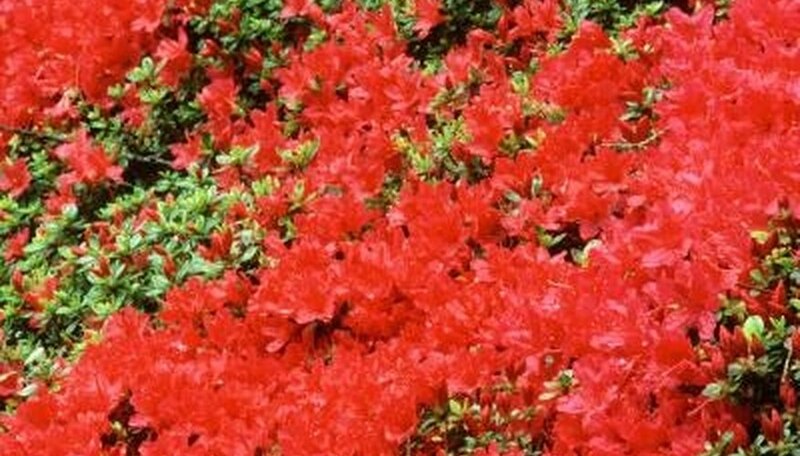 However, too much hot summer sun will injure azaleas and cause heat stress. Select a site that receives morning sun and afternoon shade. Many pests can damage azaleas. Lacebugs are a common insect that dine on leaf chlorophyll, leaving behind yellow speckles. Encore azalea is less vulnerable to lacebugs than other kinds of azaleas. Petal fungal blight, caused by Botrytis cinerea or Ovulinia azalea, causes a mold on flower petals. Azaleas that exhibit chlorosis or yellowing leaves may be responding to their soil environment. Azaleas require well-drained soil at a pH of 5.5. 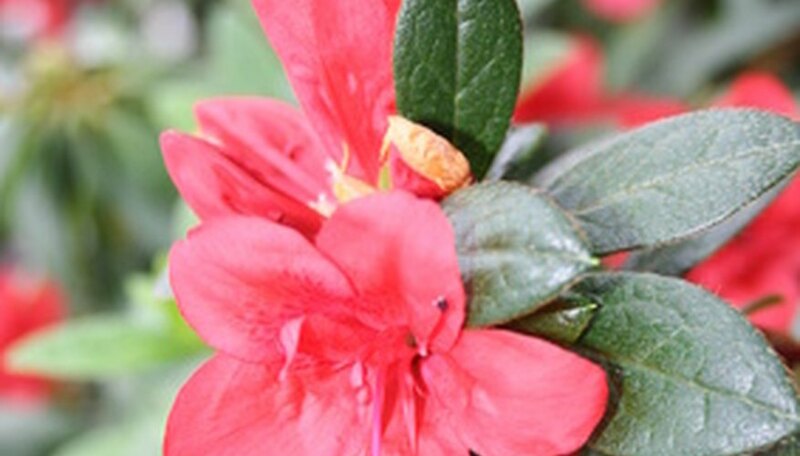 The larger Encore azaleas are more flexible regarding different soil pH levels than smaller varieties of Encore azaleas, according to Louisiana State University. According to the Encore Azalea website, fall is the best time to transplant your Encore azaleas, but it also can be done any other time of the year. The most important thing is to water your plant thoroughly and frequently for the first few weeks after you move it. 'Autumn Royalty' is a variety of Encore azalea, and actually an azalea/rhododendron hybrid. In fact, this plant was voted Azalea of the Year by the American Rhododendron Society. All Encore azaleas can bloom three times per year, depending upon your location. They are grown like standard azaleas but need just a bit more sun each day. The ‘Autumn Royalty’ blooms are large, and gorgeous shade of purple. Another Encore azalea, this one with 3-inch white blooms with pink freckles and an occasional pink stripe, reminiscent of some petunia varieties. The light green, narrow foliage creates a delicate backdrop for the flowers. Encore azaleas prefer a somewhat acid soil, they only need to be fertilized once a year and are hardy to USDA zones 7 through 10. This azalea, from the Bloom ’N Again® line of azaleas, is cold hardy to -10 degrees F, and needs to be planted in an area of dappled sunlight. The “Pink Craze” will bloom in September and then again in the spring. The flower is a very light, delicate shade of pink. Cut back azaleas with a pair of sterilized garden snips. They look like a pair of scissors and can be purchased at any home and garden store. Sterilize the snips with bleach or rubbing alcohol. Prune the azaleas in early spring before the flowers bloom. Once the azaleas begin to flower, they will have ample time to grow to maturity and produce many blooms. Remove the branches from your azaleas that are shaded out by the other branches. These branches will eventually die out due to a lack of sunshine. Remove these first. Snip off the smaller branches that do not produce flowers after blooms appear. These branches will only use valuable nutrition that the blooming branches could benefit from. Removing the non-flowering branches increases the following year's blooms. Take off the tops of the taller branches from the inside of the plant. Cut them back to the size of the height of the outside branches. Prevent the azaleas from shock by removing only a few of the taller branches at a time. Prune off any dead or diseased branches, as well as faded blossoms immediately after the flowers fade in mid-spring. Remove the mulch by pulling it away from the base of the azalea. Spread slow-release, high nitrogen granulated fertilizer around the plant, following the manufacturer's recommended rate of application. Keep the granules of fertilizer from touching the base of the plant as it can burn the bark. Replace the mulch. 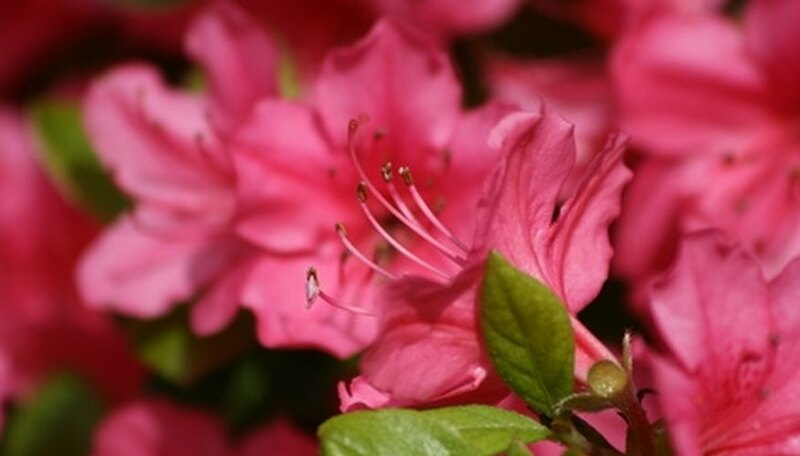 Apply granulated fertilizer that is specially formulated for azaleas around the base of the plant approximately six weeks after the first fertilizer application in the north and eight weeks in the south. Use the same method of application that you used to apply the high-nitrogen fertilizer and follow the manufacturer's recommended rates of application. Do not fertilize after July in the north. In the south, fertilize every eight weeks until early September. Evergreen azaleas grow naturally in Asian countries and bear flowers of about 2 inches across. 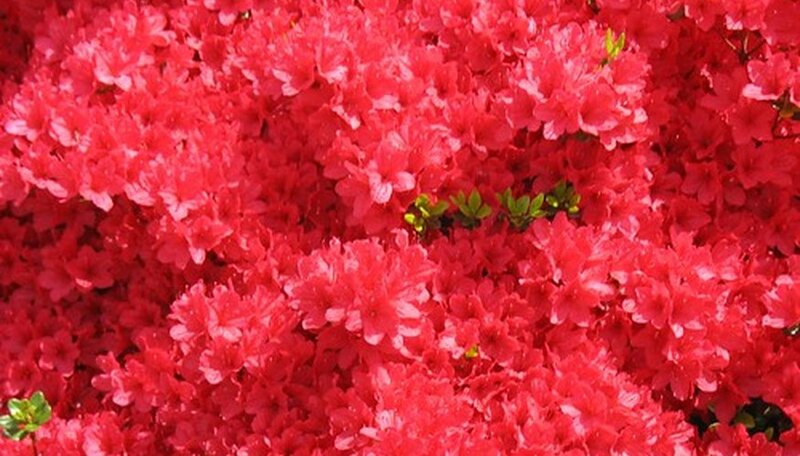 Evergreen azalea colors include red, pink, orange, white and purple. The plant has two sets of leaves, with one set dropping during the fall and the other in the spring. The type of variety you get depends on the color. 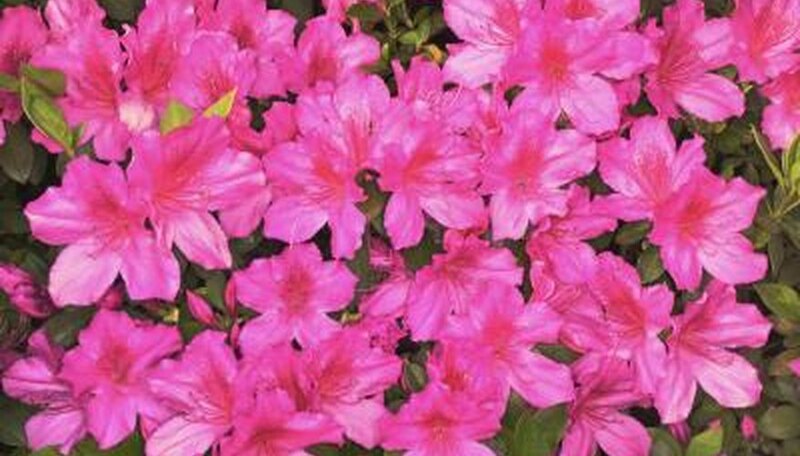 For example, The Glen Dale azalea has chartreuse, orange, pink and red colors, while the Indica (or Indian) azalea has white, red and pink colors. Deciduous azaleas can grow large with large leaves and will grow naturally in North America and Asia. They aren't as common as evergreen azaleas. During the fall season the leaves fall off, but during blooming season in spring the colors range from orange to magenta, yellow and white. Evergreen and deciduous azaleas are either species azaleas or hybrid azaleas. Species azaleas mean that it was interbred and isolated from other plants during production, whereas hybrid azaleas are a mixture of azaleas and other plant species. 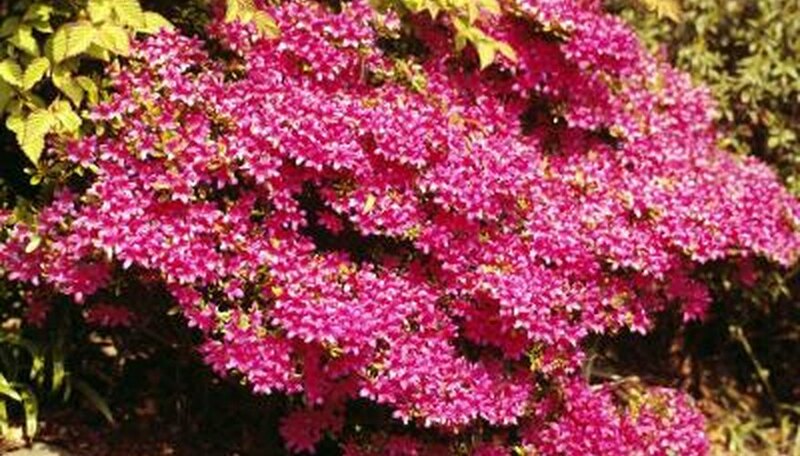 Species azaleas grow from seedlings from their parent plants, and hybrid azaleas must be grown from cuttings of a mother plant clone. Most azaleas prefer partial shade to full sun. If your azaleas receive too much sun and are not adequately watered they may come distressed and turn brown. Azaleas transplanted during the heat of the day may also become distressed and start to turn brown. Plants that are yellowed and brown may indicate a watering problem. Too little water will leave the plant parched and brown. Too much water can create root rot, which drowns the roots with excess water. Carefully check azalea roots; they should be brittle. If the roots feel mushy the plant is suffering from root rot. Deciduous azaleas, which drop their leaves in the fall, will naturally turn brown in the fall months. Don’t worry; leaves will grow back in the spring. If the leaves fall off during the summer it may point to a problem such as a diseased plant. Leaf gall is a fungus that affects azaleas in the spring, changing leaves from green to white and then brown. The North Carolina State University notes that the disease does not harm the plant, beyond making it look bad. Remove affected leaves by hand and discard. Azaleas have no finite lifespan. 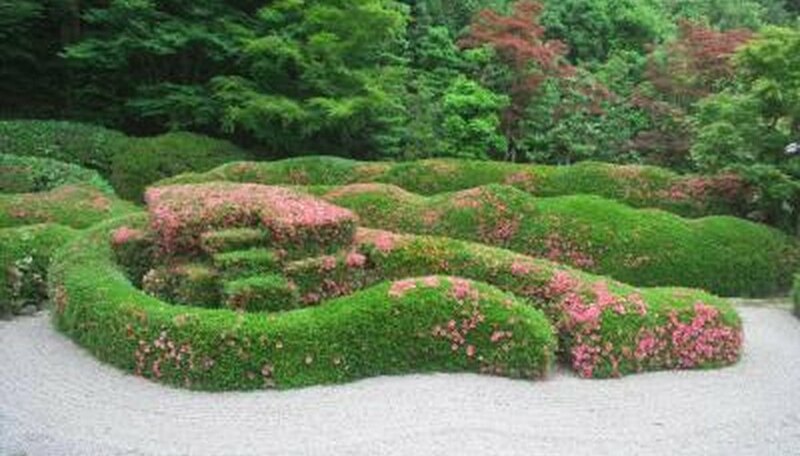 Some azaleas in Japan are reportedly hundreds of years old. An azalea can live for many generations if they are cared for properly and are planted where they have plenty of sun and good drainage. Azaleas roots are shallow and mulch is vital to protect the roots in winter and maintain moisture year-round. Four to 6 inches of decomposing oak leaves or pine needles is perfect mulches. Other options are 2 inches of hardwood or oak chips or shavings. 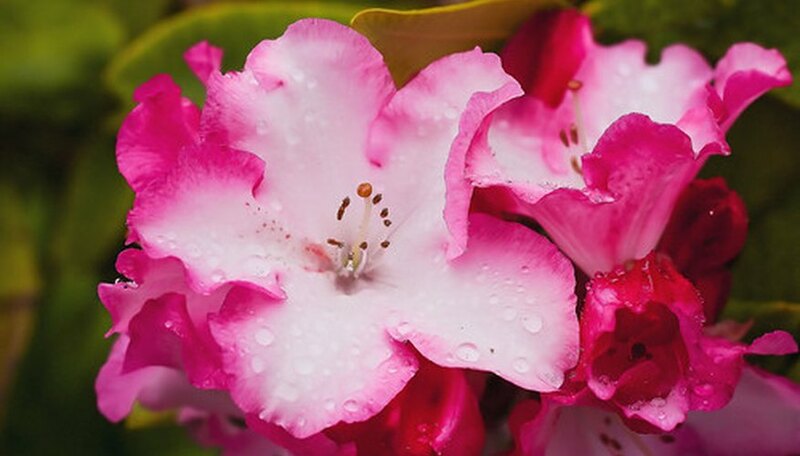 Both rhododendrons and azaleas are members of the genus Rhododendron, but azaleas usually stay smaller and have smaller leaves. Azalea flowers typically have five or six stamens, while rhododendrons typically have 10. Most azalea flowers are 2 to 3 inches wide, however they range from 1/2 inch up to 5 inches. Most flowers have five petals, but double flowers can have up to 30 petals. Some varieties of azalea plants lose their leaves during the fall and winter and enter a dormant period. Flowering usually occurs on the bare stems in spring before the leaves sprout out. Evergreen azaleas prefer a slightly warmer climate than deciduous types and they keep their leaves all year. It is not uncommon for them to drop some leaves during a harsh winter. Azaleas prefer acidic, well-draining, moist soil with organic matter mixed in. They like moderate climates, USDA zones 6 through 8, but some varieties can take lower or higher temperatures. Azaleas grow best in well-draining soil with a pH between 5.5 and 6. Their lighting needs depend on the variety. Most azaleas prefer shade, but some azaleas need full sun to grow. Check the specifics for your variety before choosing a planting site. Christina is an azalea hybrid created in 1966 by Vuyk van Nes Nurseries. The parent plants are the cultivars Florida crossed with Louise Gable. 'Christina' reaches a height of 4 to 10 feet and a width of 5 to 10 feet. It has oval-shaped green leaves that are medium-sized for the Rhododendron family--about 1 1/2 inches long. The red or pink flowers are hose-in-hose style, which means there is one flower inside of another. Blooming occurs in mid to late spring with two to four flowers per cluster. They like full sun to partial shade and a slightly acidic moist-but-well-draining soil. They can planted outdoors in USDA hardiness zones 6 through 9. Hybrid azaleas are great landscape shrubs for yards in cold climates. They are able to withstand the freezing winter temperatures and may not lose their leaves. Azaleas are deciduous or evergreen. Deciduous azaleas drop or lose all their leaves in the fall. They may lose leaves earlier in the season due to dry weather. Evergreen azaleas have two sets of leaves. They lose one set of leaves in fall and keep the other set as winter foliage. Azaleas often lose leaves due to too little or too much water. When plant roots dry out, the leaves drop off. 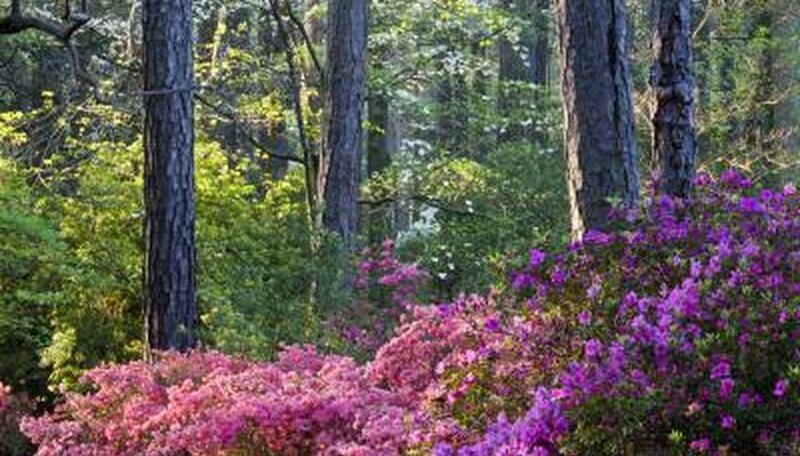 Prompt watering may revive these azaleas and encourage foliage the following season. Too much water causes roots to rot. Over-watered azaleas lose their leaves and die from waterlogged roots. Azaleas lose leaves when they are infected with disease. Humid weather and overhead watering encourage leaf spot and other fungus problems. Leaves develop fungus blotches and curl or fall off the plant. Fungicides applied promptly usually control serious damage. Naturally occurring predators of the whitefly include lacewings, bigeyed bugs, minute pirate bugs, certain species of lady beetles (e.g. Clitostethus arcuatus and Harmonia axyridis) and parasites of the Encarsia species. Removing leaves that have been infested with the nymphs and pupa of whitefly can help reduce the population to an amount controllable by natural predators. Place yellow sticky traps close to infested plants at the level of the infestation, out of direct sunlight, with the sticky part facing the plant. This strategy works best in conjunction with other anti-whitefly tactics. Remove adult whiteflies with a hand-held, battery-operated vacuum early in the morning when cool temperatures make the pests sluggish. Freeze the vacuum bag inside a plastic bag overnight to kill the flies before disposal. Thoroughly coat plants, including the underside of leaves, with insecticidal soaps and oils such as neem oil. Don't spray drought-stressed plants or during temperatures of 80 degrees Fahrenheit or above. Azaleas may be evergreen, keeping their leaves all year long, or deciduous, dropping their leaves in the fall. The green leaves on some evergreen azaleas, like 'Delaware Valley White,' may become yellow in winter. Some deciduous azaleas, including 'Umpqua Queen,' also experience foliage color changes in the fall. Stop fertilizing by July 15. Any extra nitrogen after this point will promote new shoots of growth. These young shoots are especially susceptible to cold injury and would die in the winter climate. Refrain from watering from September into the fall. This will help harden off the azaleas for the winter. If the fall is excessively dry, give the azaleas a good watering after the first killing frost. This will provide water for the plant over the winter and will not reduce hardiness. The ground should be wet before the cold weather sets in. Place a thick layer of organic mulch around the base of the plant in late fall. Azaleas have shallow roots that need protection from the cold fluctuations and hard freezes. Keep the mulch from touching the trunk of the shrub. Prune your azaleas just after they bloom. Azaleas bloom in early spring on the previous season’s growth. If you prune azaleas after they produce a flush of summer growth, the plants will have fewer blossoms the next year. Follow dead azalea branches back to the point where the azalea is alive. Living wood will have a green cambium layer beneath the bark. If you nick the bark with your fingernail, you will reveal the cambium layer. Cut back dead azalea branches to the living wood. Cut back an overgrown azalea by removing the longest branches back to the central trunk of the plant. Remove diseased branches of azaleas, branches that rub against one another or weak growth at the point where the branch meets the tree. Azaleas have delicate roots and require soil that is well drained and easily penetrable. Plant azaleas in beds rather than individual holes so that prepared soil is used more efficiently. Avoid putting your azalea bed under the canopy of shallow-rooted trees such as elm, maple or ash. The feeder roots of these trees will quickly grow into the improved soil and compete with your shrubs for water and nutrients. Azaleas must have acidic soil to thrive. The ideal soil pH for an azalea bed is between 4.5 and 6.0. If you are uncertain about the pH of your soil, obtain a soil testing kit from your local agricultural extension office and collect a sample according to directions. The soil lab will analyze your sample and send back a report detailing the pH of the soil, and offering recommendations for enriching it for optimum fertility. The most common additives used to correct soil pH are limestone and sulfur -- limestone to raise pH and sulfur to lower it. One of the keys to maintaining loose, well-drained soil is to amend it with organic matter. Depending on how hard or clay-based your soil is initially, add up to 50 percent organic matter to achieve a looser texture. The Azalea Society of America recommends using fine pine bark or rotted leaves for this purpose. You may also use additional topsoil. Avoid "hot" organic materials such as mushroom compost or materials containing fresh cow manure. These additives are too alkaline and will lower the acidity of the soil. Remove your young azalea from its nursery pot. If the plant sticks, cut the pot off. Plant your azalea in the spring after any risk of frost has passed. Dig a hole just deep enough to accommodate the root ball with the soil at the same level on the main stem as it was in the nursery pot. Azaleas have very shallow root systems, so be careful not to dig too deep. Dig the hole about a foot wider on all sides than the root ball. This will ensure that there is enough loose soil for the roots to establish themselves in. Place your azalea in the hole and gently fill in the soil. Pack the soil gently. 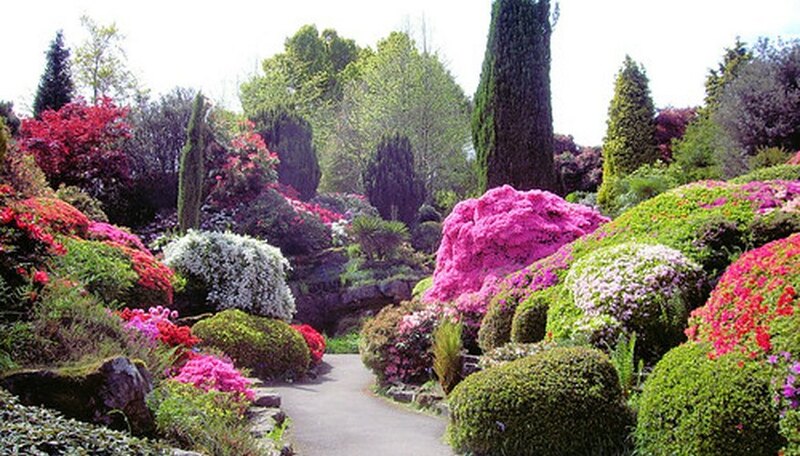 According to the Gardener’s Network, azaleas can be grown from seeds, cuttings or grafting. When grown from seed, the bush can take from two to 10 years to bloom. Azaleas may be pruned annually to control size. This is best done in the weeks just after the blooms fade. Waiting any longer risks cutting off the origin of next year's blooms, which are set in the fall. Azaleas may require a dose of acidic fertilizer a couple of times per year. Just apply to the surface of the soil around the underneath the plant and out to the drip line. If your plant is stressed due to drought, put off fertilizing until the soil is moist and conditions are better. The roots of an azalea plant are near the surface of the soil, making dehydration a threat during dry conditions. Make sure your plant receives adequate moisture by watering with a soaker hose or drip line to a depth of about 6 to 8 inches. Don't over-do it, though. Water-logged plants suffer decline as well. Although they're typically tough plants, a few problems can affect your azalea. Look out for powdery mildew (a fungus that looks like white powder on the leaves) and petal blight (mottled or damaged blooms in spring). You might avoid powdery mildew by choosing a sunnier location for the plant since the fungus thrives in shade. Petal blight can be alleviated with an application of fungicide just as the blooms begin to show color. 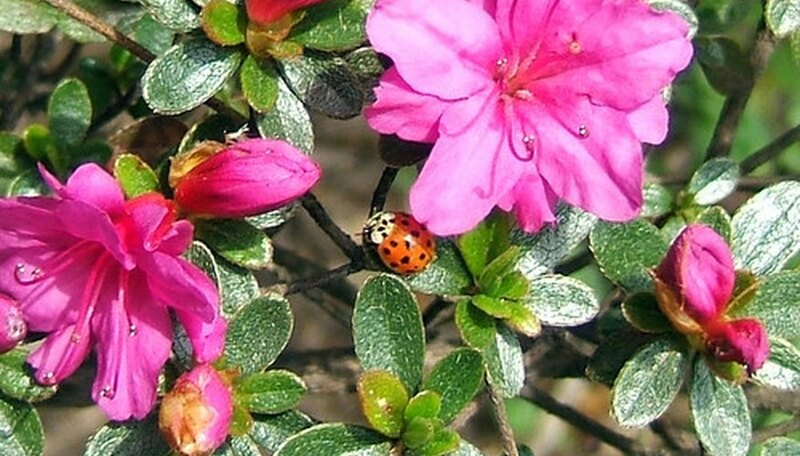 Lacebugs are among the common pests for azaleas. Look for spotted or mottled leaves as evidence of an infestation. Spraying with an insecticide may reduce or eliminate this problem. The majority of azalea varieties grow into mature, large shrubs. The average height is typically around 4 to 8 feet, according to the Arbor Day Foundation. However, some azaleas remain closer to ground covers, reaching a mature height of about 12 inches. On average, the spread of a mature azalea shrub is proportionate to its height. The tall shrub varieties reach a spread between 4 and 6 feet. When purchasing azaleas from a catalog or nursery, the listed height and spread is typically the 10-year height, according to the Azalea Society of America. This is the height the azalea will reach at its mature growth. Grow your azaleas in partially shady locations. Ensure your azaleas are only exposed to direct sun for 4 hours each day. Azaleas can grow in sunshine, but the blooms will not last as long. Ensure your azaleas flourish by locating them under pine, oak or holly trees where the soil is more acidic. Cover the roots of your azaleas with an inch of mulch created with pine bark or wood chips to prevent moisture loss and weeds. Also pile mulch between each plant to about 3 inches deep. Prune dead wood or non-flowering shoots any time. Do major pruning right after the flowers bloom to avoid cutting off the next season's buds. Soak the ground around your azaleas once a week rather than a daily sprinkling. The amount of water needed depends on the time of year and the climate but generally an inch per week is sufficient. Prune Louisiana azaleas when flowering finishes in April or May. Allow the shrub to reach the desired size before attempting to control growth. Look through the Louisiana azalea for the tallest or widest branches. Clip them off with the pruning shears. Make the cut on the inside of the bush so that the new growth will fill in gaps within the shrub's bulk. Remove branches that appear to be broken, weak or diseased. These are stealing nutrients from the rest of the bush. Prune them where they meet healthy wood. Trim branches one by one until the desired shape and size of the Louisiana azalea is accomplished. Focus more on branches in the top half of the bush. Removing them will increase sunlight and air circulation to the rest of the plant. Prune Louisiana azaleas until late June or early July. After that, there is danger of removing flower buds. Prune azaleas soon after they bloom to allow for vigorous growth and a good supply of buds the following year, reports the Texas A&M Extension. Check plants during full bloom for any wilted, dying or infected branches, which may indicate a fungus. Remove the affected areas with sterilized cutting tools until you see clean, white wood. Use denatured alcohol to keep the tool clean as you work to help prevent the spread of fungus to clean wood, recommends the U.S. National Arborteum. Before you begin pruning, consider which branches will be shaded and might naturally become deadwood. Remove these branches first. Avoid pruning too late in the season, as tender new growth might get damaged in cold climates. When Do You Fertilize & Cut Back Azaleas?